Dubliner Louis Crowe is lucky enough to carry the same name as a Belfast Celtic legend – his uncle, who starred at Paradise in the years before the First World War. Louis celebrated his 80th birthday on the 12th of July this year – the day after the 86th anniversary another famous Celt, the inspirational Charles Patrick Tully. Shortly before, Louis joined the Belfast Celtic Society, making his commitment to preserve the memory of Belfast’s Grand Old Team – even though he follows Dublin club Bohemian FC. He has sharp memories of Celtic at play, as he regularly saw them compete in the wartime Dublin and Belfast Inter-City Cup, which ran for eight years, starting in the 1941-42 season. A cross border soccer competition, conceived many years before the Setanta Cup filled the coffers of today’s Irish clubs, it was a major tonic to the austerity of ‘The Emergency’ years and Boh’s ground, Dalymount Park, was used for the Dublin legs of the aggregate tournament. Celtic had a chequered history in the competition, losing three finals against Glentoran, Shamrock Rovers and Crowe’s beloved Bohemians, before they were declared joint winners, along with Distillery, in the 1947-48 season. Louis remembers many of these games and despite his allegiances to Phibsborough’s ‘Gypsies’, Celtic left a lasting impression on him. He said; “I have personal memories of Belfast Celtic in the 1940’s. There was a competition called the Inter City Cup, played between clubs from the north and south, usually in April and May when the main leagues were over. I spent many happy evenings at Dalymount Park as a schoolboy. I loved watching Celtic - they were always immaculately turned out, with Paddy Bonner on the wing, Jimmy McAlinden and Charlie Tully in the side with Jackie Vernon – the greatest centre-half I ever saw. A hero of mine was Thomas ‘Bud’ Aherne. One day, I was going down Talbot Street with my dad and ‘Bud’ skipped past us. At Dalymount though, all was fair in love and war and despite Louis’ admiration for Belfast’s ’Stripes’ – and his family connections through his namesake uncle - the serious business of the Inter-City Cup left no room for sentiment for the follower of the red and black! 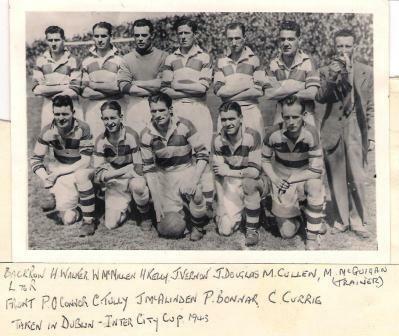 Even though the memory of the Inter-City Cup has slipped into the mists of time, all participants in those days took their involvement in the tournament extremely seriously – and under ‘hand’ tactics were even employed to ensure the title wouldn’t finish up in Belfast one year. Employing the maxim that a good confession can never come too late, Louis has come clean about the incident in the 1944-45 competition, which may stir memories of more recent sporting shenanigans, involving Ireland’s international side and that most hated Frenchman! So there we have it folks! 65 years after the event, Bohemian’s fans can breathe a collective sigh of relief in coming clean about their own ‘Hand of God’ moment, which cost Elisha Scott’s Celtic another cup for their creaking cabinet! But clearly, Celtic held no grudges and bygones were made bygones just four years later in 1949, when Mick O’Flanagan was invited as a guest player to tour the USA with the Grand Old Team. Also remembered as an excellent Irish rugby international, Mick went on to play a key role in the side which took the glorious scalp against British champions Scotland in New York. 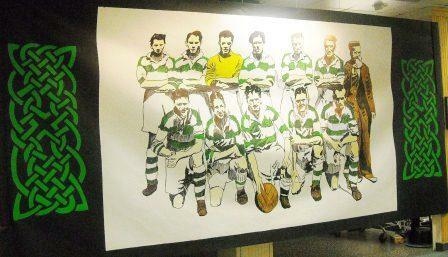 Although the Inter-City cup is now largely forgotten, it lives on to this day in the Belfast Celtic Museum, where the fantastic mural painted by local artist Martin Dillon depicts Celtic’s Inter-City Cup team of 1943, captured forever in time on the pitch at Dalymount Park. Many of those remembered so vividly by then schoolboy Louis Crowe are in the squad – along with various other stellar performers who live on in the hearts of those they leave behind. Father and son football memorabilia collectors Gary and Bernard Spain, based in Dublin and Limerick respectively, recently provided the Belfast Celtic Society with many copies of programmes they have in their collection related to the Belfast Celts. Among these are Inter-City Cup programmes and the one pictured here is from the second-leg game at Celtic Park as Bohemian FC travelled across the border to clash at Celtic Park on Saturday, May 23 1942. Even corners counted in this battle of the Irish and they would count dearly in the 1943 final, as Bohs fell to their great rivals, Dublin Hoops Shamrock Rovers, with corners deciding the tie, which had finished in a two-all draw. The programme also reveals that Celtic were experimenting with their team line-up, as Harry Walker was playing at inside-left, while Peter O’Connor was preferred in up front. Admittedly, it probably wasn’t much of an experiment, as O’Connor had already distinguished himself in attack the year previously, when he bagged 11 goals in a 13-0 rout of Glenavon. And who was in goals for the Lurgan Blues that day? 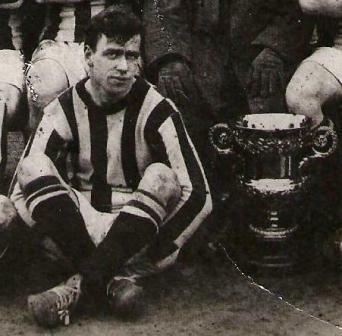 None other than crowd favourite Hughie Kelly, who had kept Louis Crowe entertained at Dalymount Park. Despite losing 13 goals, Celtic Manager Elisha Scott signed Kelly for Celtic in the wake of the game because, despite Glenavon’s heavy defeat, Scott felt it would have been even heavier were it not for the cat-like Kelly between the sticks. And who is in the Boh’s side for that game in ’42? 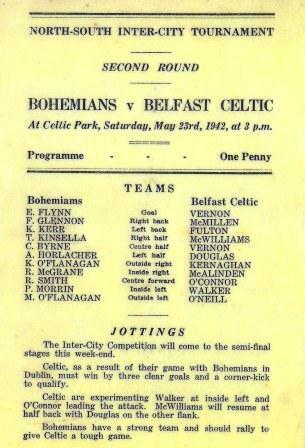 The programme lists none other than Mick O’Flanagan at outside-left, the Bohemian hand-ball hero who would later help hammer Scotland five thousand miles from home, as Belfast Celtic were preparing to slip quietly into history. If, like Louis Crowe, you value the memory of Belfast Celtic, then please follow his example and join the Society committed to keeping the name of the club alive. You can do so by clicking here.